After last month’s violence in Charlottesville and its disturbing political repercussions, towns across the nation are pulling down their Confederate statues and monuments, while debate over their meaning and place in American culture continues. Supporters of the statues claim they are works of commemorative art, memorializing a past that many of them see as a symbol or even a guarantor of the legitimacy of their social and political values. Protesters are no less outspoken in their condemnation of the same figures, which for them embody racism, intolerance and hatred. Memorial to the Murdered Jews of Europe, Berlin, Germany. Photo by André Zahn. For towns to choose to remove these statues is an understandable approach. But is it the right one? As a professor of German culture and history, I have long admired the deliberate efforts Germany is making to come to terms with its own horrific past. Although it took a couple of decades after the Second World War for most Germans to begin to confront openly the unspeakable crimes committed during the Nazi regime, once they did, they did so with a commendable and determined dedication to the truth. As a result, the full, awful reality of Nazi rule and its destructive, murderous legacy is today an inescapable part of the fabric of everyday life in Germany. Hardly a day goes by even now when one does not encounter some reminder of the National Socialist era — be it a television documentary, a museum exhibition or a newspaper article. Children are taught about the Holocaust in school and class trips to former concentration camps are part of the curriculum. Most German cities — modern, efficient, gleaming precisely because they were built on top of the ruins that were virtually all that remained in 1945 — provide mute but eloquent testimony to the wholesale devastation brought about by Nazi rule and, not incidentally, to the eternal potential for rejuvenation and renewal. 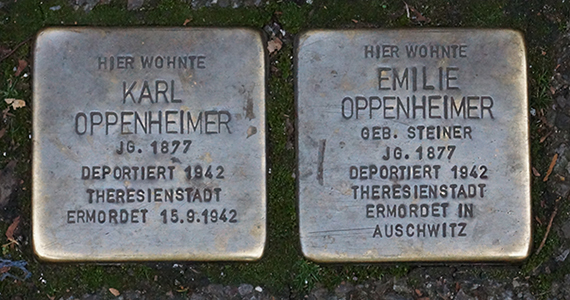 Stolpersteine in Stuttgart. Photo by Croesch. 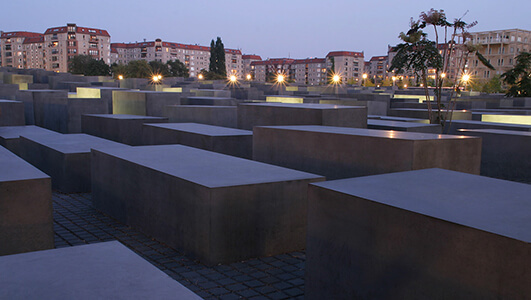 The largest and most important official testament to the inhumanity of Nazism is Berlin’s Memorial to the Murdered Jews of Europe, which is adjacent to the famous Brandenburg Gate. The monument occupies an enormous city block, almost five acres in size, and consists of 2,711 smooth, rectangular concrete slabs arranged in rows of varying height. In their gray, featureless austerity, and in the relentless sameness of the blocks, they convey both the anonymity of the victims being commemorated and the implacable, brutal forces that obliterated them. Predictably, the monument’s conception and its very existence remain contentious. No design could have satisfied everyone. But as a public statement, located in the center of the German capital as a constant and prominent reminder of the nation’s darkest deeds, it sends a powerful if somber message. It says: This is what we did. We do not deny it, we do not excuse it. Instead, we frankly acknowledge it and, we hope, continue to learn from it. The memorial is what the Germans, in an earnest play on words, call a Mahnmal. It is not a monument, or Denkmal, in a conventional sense — literally, a “mark” or “place” of “thinking” — but rather it is a place of mahnen, of admonishment and of stern warning. A Mahnmal directs us to reflect on the past, but it also challenges us to act — presumably differently — in the present and the future. Destroying symbols of the past that cause us pain may give us the deceptively comforting feeling that we are also annulling the historical events that gave rise to those symbols in the first place. But of course the ideas represented by Robert E. Lee and his confederates will not simply disappear when, or if, the statues in Charlottesville — and in other cities — are eventually taken down. Indeed, certain ideas seem to proliferate when there is no visible public display that prompts debate to oppose them. Many commentators have remarked on the apparent historical irony that, of all countries, Germany now stands as perhaps the strongest, most stable and most steadfast democracy in the world. It is worth considering whether the German approach to history — unflinching, unsparing, unafraid to look directly into the abyss — has had a decisive influence not only in preventing the country from repeating the most terrible mistakes of its past, but also in bolstering its hard-won commitment to upholding human dignity and freedom. Perhaps the moment has come for us as Americans not to tear down the distressing reminders of a hateful patrimony but instead to construct our own national Mahnmal, one that exhorts us to live up to humanity’s highest ideals by confronting us with the dire consequences of surrendering to our worst impulses. Robert Norton is professor of German and concurrent professor of philosophy at the University of Notre Dame. Originally published by Robert E. Norton at magazine.nd.edu on September 14, 2017.